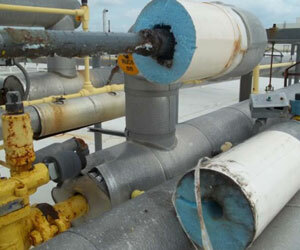 Visually observe the entire piping system for deteriorated piping and insulation. As determined by the visual inspection, ultrasonically test 25 (or 50) points to determine the remaining metal thickness of suspect piping and vessels. Any insulation removed for testing is replaced, unless pipe is excessively corroded, and the vapor barrier is reinstalled as new. Provide follow-up consultation to discuss the findings of the inspection. Provide a written report of findings and recommendation including onsite conditions, pipe, vessel, and insulation condition, remaining material thickness at test locations and % material loss. Each point is referenced by location and size. This inspection will require access to your facility and the use of your Scissor lift.Scope of services to be performed or supervised by trained Mechanical Engineer.